Nonprofit Lobbying Strategy: Challenging or Championing the Conventional Wisdom? 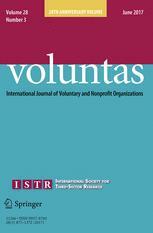 NGOs, ‘Straddler’ Organisations and the Possibilities of ‘Channelling’ in Indonesia: New Possibilities for State–NGO Collaboration? Transnational Debt Movements: Challenging States and International Decision-Makers, or Intermeshed with These?